The What: The Lowell LCDR is a line of configured racks. The What Else: The LCDR with tempered glass front door is made to fit the high-end decor of executive boardrooms and home theatres. The welded 16-gauge steel frame with charcoal gray textured finish has a solid top with vents and factory-mounted whisper fans already in place. Several 19-inch panels and vented shelves are installed leaving plenty of room for rackmount equipment. 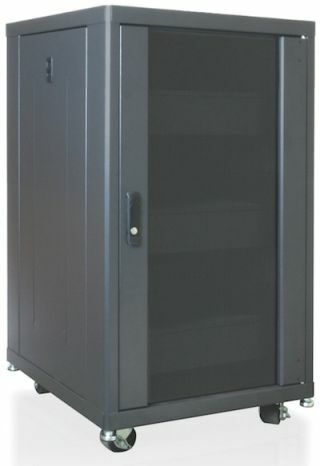 The side panels and a rear access cover can be locked for security or removed for access, while cables can be easily routed through top/bottom holes with inset grommets. The Bottom Line: The LCDR includes casters for portability plus leg levelers to provide a secure footprint. This ready-to-use EIA/TIA/RoHS compliant rack is available in 18-24 rack units (24 inch depth x 22.3 inch width) and is slated to begin shipping in June.